With work continuing apace on the new £20m depot and regional headquarters that will replace its sprawling Larkfield complex, First Glasgow has released artist’s impressions of what the new facility will look like once it is complete in October this year ready for full operation from November. 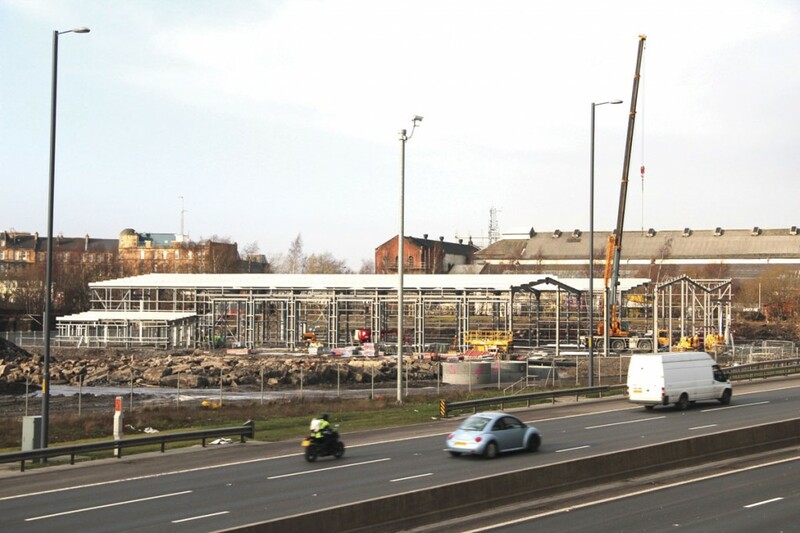 Located only a stone’s throw from the 85-year old Larkfield garage on the edge of the Gorbals area of south Glasgow, the new depot will be unusual in that it is being constructed on both sides of a motorway with a tunnel linking the two sites. First claim it will be the biggest bus depot in the UK as it has been designed to accommodate up to 450 buses and 1,200 employees. The initial allocation will not be this large; it will be limited to the current Larkfield allocation of approximately 300, though the intention is to grow this as patronage increases. Originally built as a bus garage by Glasgow Corporation at the end of the 1920s, the old depot is a long way past its best and in need of replacement. The contrast between the modern fleet which includes hybrids and the ageing architecture is marked. 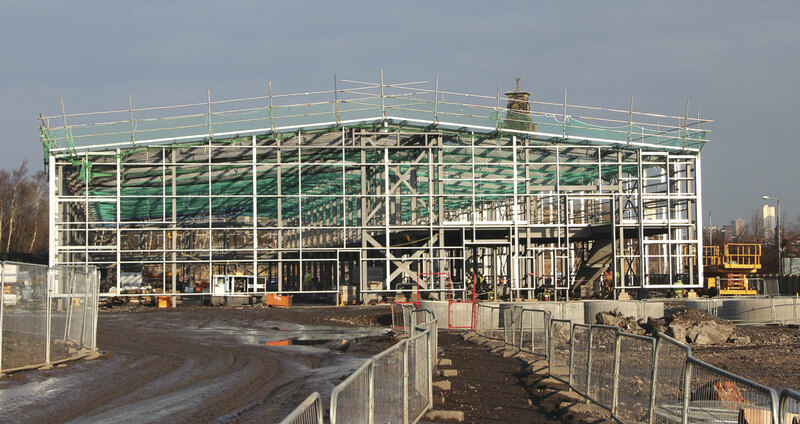 The land was formerly a rail freight terminal and it is bordered on one side by an impressive stone wall of the railway era that has been cleaned and will be completely re-pointed before the build is complete. Although currently referred to as Gushetfaulds, after the rail yard, it will not be known by this title in future but by a name yet to be chosen by employees as part of a competition that will enable them to put their stamp on it. Suggestions will be invited and the winner chosen by a staff vote on the suggestions put forward. Another competition held has involved children from the area, both individually and in groups, producing artwork for display on the hoarding boards that line the site’s frontage on Cathcart Road. The entries will visually tell the story of why the children enjoy bus travel, who they travel with on the bus and where they go. The competition has just closed and the public will be able to see the results of the children’s creativity in place until May, when the first stage of the site is scheduled to become operational. From the many entries, four school pupils will be chosen as winners and their designs will additionally be displayed on the rear of some of the First fleet in the area. Construction work began on the 12-acre site last November when Scotland’s Deputy First Minister and local MSP, Nicola Sturgeon, officially planted the first spade in the ground at a special ceremony. Donning protective wellies, gloves and a hard hat, as well as safety spectacles and a high-vis jacket, I visited the site with First Glasgow Engineering Director, Kenny Dickson and PR Manager, Emma Latimer. We were shown around the busy site where everything is on schedule for the completion of stage one in May and total completion on time in October. A massive amount of work has already been done, and though I was told that 30 January when I visited was only the third dry day this year, the weather has been generally kind. So much of what has to be done cannot be seen when the keys are handed over because by that stage it is hidden underground, but we were shown some of the work done on recycling as part of the stiff targets set on environmental impact, and the separate attenuation system to ensure that any rainfall on the premises is only admitted to the sewage system at the rate of six litres per second. The main framework for the key buildings is up and the service building, which will house the bus washes, fuelling stations and cleaning areas, has already been roofed and clad. 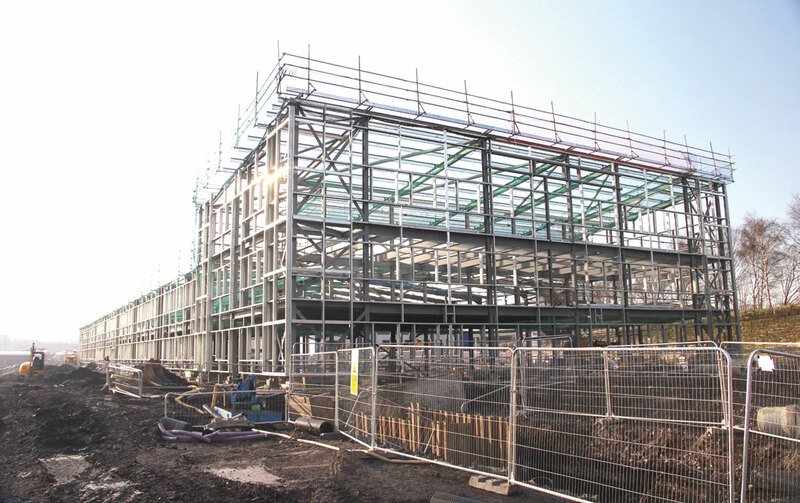 Fully framed with part of the mezzanine floor in place and the roof about to go on was the main building on site, housing the offices, engineering, and other functions. This will be the structure that is most easily visible from the road by passing customers. At the end nearest to central Glasgow it will have a three storey office building with the directors’ suite and boardroom on the top floor, on the first floor will be the depot’s training and stores activities and open plan offices and meeting rooms, while the ground floor will be the main maintenance provision. This will offer 14 pit bays plus two inspection pits and three hard standing bays served by mobile column lifts. On the opposite side of the motorway, progress on the other main building, the Regional Repair and Engine Centre (RREC) is similarly advanced. It will house ten areas for bus maintenance, a new state-of-the-art paint booth facility and metal and woodworking shops. With gantries provided for installing glass, it will handle damage that can be repaired in two days. Anything requiring longer will be sent to the regional centre in Aberdeen. Visiting in this early stage was hugely impressive and I am sure it will be far more so when it is complete. I look forward to returning in November to see the finished product and I’m sure the team currently at Larkfield will be awaiting the day even more eagerly.